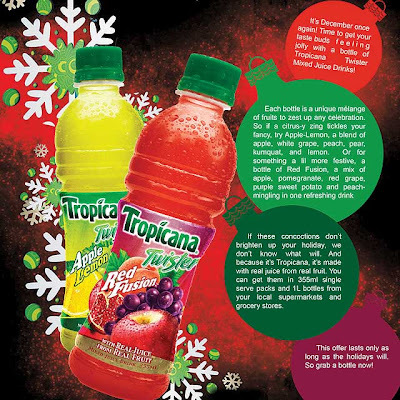 Start 2012 with Tropicana Twister's new flavors! Drink to the New Year with a perfect twist! Tropicana Twister has two new blends to start the year. Let’s welcome 2012 with Trop’s new flavors! Apple-Lemon is a blend of apple, white grape, pear, peach, kumquat and lemon. Red Fusion is a mix of apple, pomegranate, red grape, purple sweet potato and peach. Both drinks are unique, with real juice from real fruits! You can get them in 355ml and 1L bottles at your local supermarkets and grocery stores. Note that the mixed juice drinks are offered at a limited time only, just for the first few months of the year. So get them while supplies last and drink to the New Year with a perfect twist.